At the moment i own a Rad Arrow Paramotor 120cc petrol, This motor has a 1.2m carbon fiber proppeller,so im going to use this prop on my project. This motor produces 50kg of thrust. I do not require this thrust so I have used an online model aircraft propeller calculator and played around with the figures to give me an idea of what propeller rpm I need. I’m unsure of the accuracy of this but it’s the only thing that gives me an idea so far. 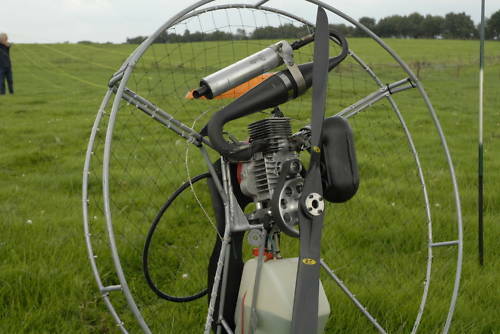 I may build a thrust rig for my current paramotor and record what rpm is needed for 35 to 40 kg of thrust. At the moment I'm assuming I need 2000rpm 2200rpm prop speed.